July 18, 2017 marks the 200th anniversary of Jane Austen’s death. 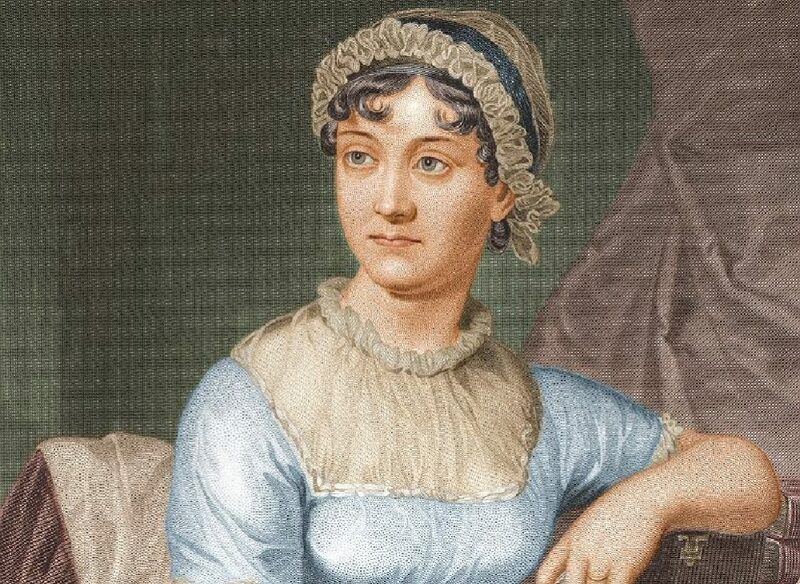 Known for her six novels about the trials and tribulations of eligible young ladies of the British gentry at the beginning of the nineteenth century, Austen’s appeal is not confined to time or place. Her novels have been translated into almost all European languages as well as Chinese, Hebrew, Turkish, and Japanese. There have been 30 film adaptations of her novels, not including those loosely based on her work. Not widely read until after her untimely passing at age 41, her works became popular around a decade and half later, were all republished in 1832, and have not gone out of print since. Many outside the literati have loved Austen; even politicians and social scientists. British Prime Minister Benjamin Disraeli supposedly read “Pride and Prejudice” 17 times. Economist John Maynard Keynes read Austen’s novels on his ocean voyages to the United States (Keynes was afraid of air flight). The answer is simple. Like Smith, Austen examines individual moral values. Her novels illustrate, teach, and extol the importance of individual moral values. Austen offers keen insight into the old-fashioned but timeless virtues and vices that shape individual character and actions—and, make no mistake, these shape our collective social and economic lives. Smith tells us in “Theory of Moral Sentiments” that “Self-command is not only itself a great virtue, but from it all the other virtues seem to derive their principle lustre.” Self-command is not a term commonly used in ordinary speech today. Most contemporary readers naturally think of self-command as self-control. While self-control is a component of self-command, the virtue is more comprehensive to both Smith and Austen. It consists of the ability to govern one’s feelings and channel one’s emotions to proper and productive ends. “Sense and Sensibility,” Austen’s first published novel, is filled with direct and indirect references to self-command. The novel centers on the romantic interests of two young and relatively impoverished sisters, Elinor and Marianne Dashwood. Elinor’s romantic interest is in the shy Edward Ferrars, Marianne’s in the flamboyant John Willoughby. At points in the story, both find their love interests dashed. On these occasions, Elinor exhibits admirable self-command, while Marianne is devoid of it. Although Austen certainly makes us admire Elinor’s self-command, she also teaches how Elinor nurtures and develops it. This denunciation of self-command takes its toll later in the novel when Willoughby jilts Marianne in no uncertain terms. Marianne makes a public scene, has fits of grief and gloom, remains in bed for days, and imposes burdens on her sister Elinor and their affable hostess, Mrs. Jennings. In the meantime, the real reason for Edward’s less-than-romantic friendship towards Elinor is revealed: he had years ago made a secret promise to marry the boorish Lucy Steele. Lucy revealed the secret to Elinor, and Elinor suffers a great deal of distress. Nevertheless, Elinor’s self-command comes to her rescue. When Lucy informs Elinor of Edward’s unavailability, Austen tells us: “Elinor’s security sunk but her self-command did not sink with it.” Although quite upset by the revelation, Elinor refrains from showing emotion to Lucy. In private she is at first infuriated with Edward but then reflects on his situation. He had made the pledge at an early age and it was admirable for a gentleman to keep his word, even to a creature as horrid as Lucy. She also knew Edward’s family would never accept Lucy, and that she would be a terrible wife. Austen tells us, “As these considerations occurred to her in painful succession, she wept for him, more than herself.” Again, self-command is reinforced by being other-directed. Elinor keeps her word to Lucy and reveals the secret engagement to no one. Compare this to Smith’s insight that most unhappiness emerges from “over-rating the difference between one permanent situation and another.” The lecture seems to work, for Marianne indicates immediately: “your resolution, your self-command, are, perhaps, a little less to be wondered at.–They are brought more within my comprehension.” By novel’s end Marianne does acquire a great deal of self-command (no spoilers!). “Sense and Sensibility” is not only a charming and engaging story set in the English Regency period, it is a moral lesson about the virtue of self-command that transcends time and place. Most conservatives and classical liberals differ from progressives and socialists in that we see human nature as more or less constant over time and place, and not amenable to “social engineering.” In fact most of us on the right side (pardon the pun) of this divide are horrified by the thought of active, government-directed social engineering. This does not imply we conservatives and classical liberals are indifferent to individual morality. Quite the opposite: we see good moral choices by individuals as necessary and essential for a free and well-functioning market economy. Surely at the heart of this are individuals who master self-command. As Russian author Alexander Solzhenitsyn stated: “Freedom is self-restriction! Restriction of the self for the sake of others.” But if we are to avoid a National Agency for Self-Command, how can Americans inculcate this virtue? The answer lies in how virtues have been inculcated for generations: in family, community, religious institutions, and in good entertainment. Austen’s novels aren’t just fun, they are tools that can teach the difference between right and wrong. They are novels that build character. They not only teach us lessons on self-command but on other virtues such as prudence, justice, and benevolence, and on such vices as pride and vanity. So those interested in promoting moral education should use them. In a world of increasingly coarse entertainment, Austen’s novels, and most of the media adaptations of her works, are beacons of entertainment that are also ethically uplifting. That is something we can all celebrate! Dr. Cecil E. Bohanon is a professor of economics at Ball State University. He obtained his B.A. from Wilmington College (Ohio) and his PhD from Virginia Tech, where he studied under Nobel Prize-winning economist James Buchanan. He is co-author with Michelle Vachris of "Pride and Profit: the Intersection of Jane Austin and Adam Smith."